This garden topper makes a great accent with a jar candle or a mason jar filled with flowers.Â Also works great as a door wreath! This garden topper makes a great accent with a jar candle or a mason jar filled with flowers. Also works great as a door wreath! We will be creating this adorable wreath in class. We will be going over applique, using foam, and more. This project may look hard, but it really isn't! This is a great class for a beginner! (8) 5" x 7" colored scraps for applique on leaves. 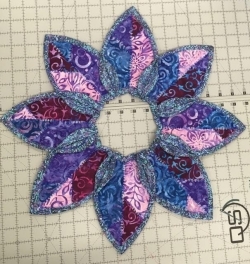 These should be cut into the applique pieces of choice in the pattern WITH applique backing. Remember, any class supplies gotten at the store for this class are 10% off!